“Bourbouristi” is the popping sound snails make when frying. 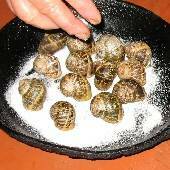 Snails fried in the shell on a bed of salt may sound strange, but they are delicious and very easy to make. 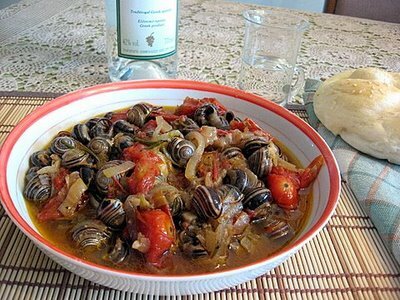 Oil, vinegar, and rosemary give the fried snails a uniquely Greek flavor. 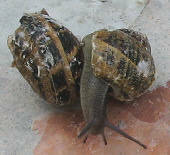 Clean the snail shells, and remove the covering on the lip of the snail with a sharp knife. Discard any snails that aren’t alive (the lip will be gone, withdrawn into the shell, etc.). Sprinkle the bottom of a 9 or 10 inch frying pan with the salt over medium heat, and put in the snails with the open side down on the salt . Cook for 1-2 minutes, add the oil, reduce heat to medium-low and let cook for 25 minutes. Add vinegar and stir the snails. Sprinkle the rosemary over the top, and when the oil bubbles up, remove from heat. Spoon onto serving plates and drizzle with a little of the pan juices. Serve hot. Yield: serves 2 as an entree, 3-4 as a meze.